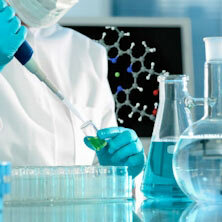 Molecular Science is a discipline at the intersection of various scientific subjects. Most of your time will be devoted to investigating molecules and their formation, structure and conversion. This highly interdisciplinary degree programme combines elements of inorganic, organic, physical and theoretical chemistry and aspects of various related disciplines relevant for animate and inanimate matter. You will also gain knowledge in materials science, technology, medicine, pharmacy and biology. All of these disciplines form the basis for the two specialisation modules Molecular Nano Science and Molecular Life Science, one of which you have to choose. There is a qualification assessment process for this degree programme. Information about the process is available on the degree programme website. Mathematics and physics are essential. These two subjects are a key part of the degree programme in the first year. Later on you will still have to deal with the occasional formula. You need to be determined and patient, even when things don't work the first time. Preparing for lectures and revision can also be hard work. During the semester breaks there are no lectures but there are still examinations and laboratory courses during this time. The degree programme Molecular Science is currently exempt from admission (NC-free) and can only be started in the winter semester. Applications for enrolment are normally made between the beginning of June and the end of September online via www.campo.fau.de.